All my life I've been a competitive individual. Whether it was getting the highest score on my english exam or beating my sister to the living room on Christmas Eve. 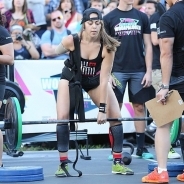 My name is Krystal Cantu and I am a 24 year old Adaptive Crossfit Athlete. I've been doing crossfit for a little over a year now. I was introduced to crossfit 8808, an affiliate at the company I work for (Rackspace), early last year. I had my doubts and fears about it but after experiencing my first WOD, I never went back to my regular routine at Golds Gym. I loved the challenge and variation it gave me every day. In August of 2013, just a few months into crossfit, I was in a car accident that resulted in the amputation of my right arm (above the elbow). I was on my way home to the Rio Grande Valley with my boyfriend, Daniel, when our tire blew out. Daniel, the driver at the time, lost control of the vehicle and we flipped several times. During that time, my right arm was ejected from my window and crushed between the truck and the road. At the time my arm was still attached, but my blood vessels were done for and the arm had to go. The first thing that came to mind when I first saw my arm.....crossfit. I had my first crossfit competition set for August 19th. My accident happened on the 2nd of August, 17 days before my competition. I knew that competition was out of the question, but that wasn't the end. I was out of the hospital three days after the accident and back at work and crossfit 1 month later. My mind ran at 100mph thinking of the new movements and adaptations I would have to perform. Together with my coaches and loved ones, I picked up movements in no time and had my endurance back up. Exactly 3 months from the accident, I competed in the 2013 Working Wounded Games, my first crossfit competition. It only got better from there. I trained harder and put in the hours to get stronger and compete in non-adaptive competitions under the scaled division. I competed again in February in a scaled division. I was the only female adaptive athlete, but I did not scale the movements and I performed the weight prescribed of the scaled division. I also didn't place last. I knew then that I had to work harder and make it a goal to hit the podium in a future competition. I may not have my right arm, but I have the highest spirits and the biggest heart. I work hard because I know I am more than capable of performing at the level of an athlete with two arms. No weight or movement is ever impossible with crossfit, that's the great thing about it. My heart still races every time the clock counts down. I still say a little prayer before every WOD and I still get extremely nervous with every competition, but that's what I love about this sport. It will never get old or boring. I train because every day I see improvements. Every day I get stronger and every day I prove to myself that the human body is an amazing thing when you have the right mind set. Never make excuses. Know that there is someone out there that has it worse than you do. Know that with faith, all doors are open. Know that only you have the power to be your biggest enemy or your biggest fan. Stay strong.